28 November 2018, Uganda - The Government of Uganda launched its first ever National Adaptation Plan for the Agriculture Sector (NAP-Ag), which will guide mainstreaming of climate change in agriculture sector policies, plans and budgets. The strategic framework, launched by the Ministry of Agriculture, Animal industry and Fisheries, working closely with the Ministries of Water and Environment and that of Agriculture, was developed with technical support from the Food and Agriculture Organization of the United Nations (FAO) and the United Nations Development Programme (UNDP), through the programme “Integrating Agriculture in National Adaptation Plans” (NAP-Ag). The NAP-Ag programme, funded by the International Climate Initiative (IKI) of the German Federal Ministry of the Environment, Nature Conservation and Nuclear Safety (BMU), supports partner countries to identify and integrate climate adaptation measures for the agricultural sectors into relevant national planning and budgeting processes. The Uganda NAP-Ag framework presents 21 priority adaptation options in the key areas of: crop production; livestock production; fisheries management; climate information, early warning and disaster preparedness; forestry, land and natural resources management; and research and knowledge Mmanagement. Speaking at the launch of the framework in Kampala today, the Minister for Agriculture, Animal Industry and Fisheries, Honorable Vincent Ssempijja commended the partnership of different stakeholders, including UN agencies, government institutions, non-state actors, academia and other research agencies, saying that addressing climate change requires concerted efforts of all relevant stakeholders. “l am glad that the agriculture sector is a champion in developing her sector specific National Adaptation Plan and mainstreaming guidelines. This will support actions to reduce vulnerability to the impacts of climate change, and facilitating the integration of climate change adaptation into relevant, new and existing programmes,” the Minister said. The United Nations Resident Coordinator, Ms Rosa Malango, pointed out that the plan presents adaptation actions relevant for the different agro-ecological zones and that it will guide farmers, technical officers and decision makers on investments that will build resilient communities, systems and institutions as Uganda proceeds to upgrade its agricultural sector. “The agriculture sector has an important role to play in Uganda’s economic transformation. 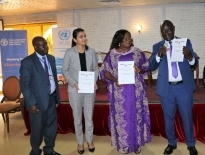 However, the contribution of the sector to Uganda’s development has slowed down over the past few years, partly due to the negative impact of climate change,” she said. “Farmers can no longer predict when is the right season for planting as weather patterns have become erratic and extreme weather conditions like frequent floods, prolonged droughts, unreliable rains have become the new normal. There are also new pests and diseases affecting crops, animals and humans. These affect the overall productivity of the agricultural sector and the wellbeing of the families who depend on it to survive,” Ms Malango observed. According to the Uganda Bureau of Statistics, agriculture accounts for about 24 percent of the nation’s GDP and provides direct employment to over 68 percent of the total labour force; most of whom are women and youth. “Women are the bread winners in most rural households. They fetch water, gather firewood and tend gardens. They are the hardest hit by the negative impact of climate change. We should act consciously to find solutions for climate change that are gender responsive and give rural women relief,” Malango said. The launch was also attended by other dignitaries including; the FAO Deputy Country Representative Ms Priya Gujadhur, the Director Environmental Affairs in the Ministry of Water and Environment, Mr Paul Mafabi, Members of Parliament on parliamentary forum on natural resources and climate change, Civil Society organizations (CSOs), academia, research institutions, among others. Mr Paul Mafabi called upon all stakeholders to join hands and fight against climate change impacts and adopt practices that will ensure long term sustainability of the wetlands, forests, lakes and the environment in general. “Each of us can do something to support this noble cause including growing trees, practicing climate smart agriculture, proper management of waste and using energy efficient cook stoves,” Mafabi further explained, adding that the agriculture NAP-Ag has set a good foundation and precedence for the preparation of National Adaptation plans for other sectors which is already ongoing. The agriculture NAP strongly links to Government commitments under the Paris Agreement on Climate Change and the Sustainable Development Goals (SDGs). Uganda has devoted some considerable efforts to the national response to this global challenge by developing a National Climate Change Policy (NCCP) and establishment of a Climate Change Department (CCD) in the Ministry of Water and Environment to coordinate the implementation of the policy. With the framework in place, the next steps include dissemination of the plan to relevant stakeholders, resource mobilization and actual implementation of the adaptation options that have been raised as priorities for Uganda.